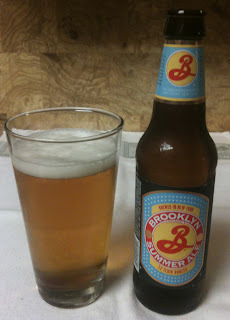 I looked back through the blog, and the only other beer from Brooklyn Brewery I have tried was my third for the year - their Winter Ale. Now it is summer and I am sampling their Summer Ale. The twelve ounce bottle shows 5% ABV. Their web site lists IBUs at 18. This is a seasonal, available March through July. This beer poured with a medium to thick, bone colored head. The beer is a darker golden yellow shade, not quite into an amber. There is some definite sweetness to the aroma, some herbal, maybe a little citrus. Mild to medium bodied. The taste has some malt, sweetness, citrus and is a little grassy. Carbonation is a somewhat fizzy. Seems thin on the finish. Mild "beer" aftertaste. 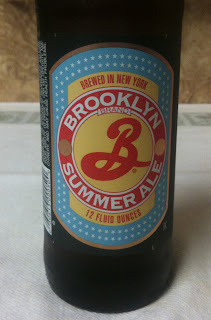 Nice summer beer, but a little mild for my taste, especially on the finish.